The next test is two tags combined. This is where the alternative approaches really pull ahead of the traditional tagging approaches. That's a huge difference. The "JSONB fixed" numbers are for a query where I force the planner to use the JSONB index instead of letting it choose its own path (using the doc_id index). 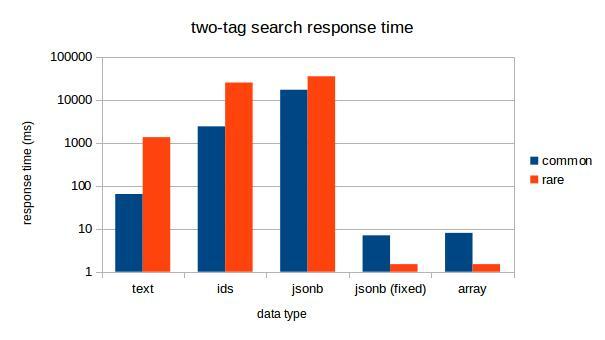 As you can see, two-tag search via GIN index is an order of magnitude faster for common tags, and three orders of magnitude faster for rare tags. And the ID approach completely bombs for two-tag search. For our final test, we'll build a tag cloud from scratch. This involves pulling counts of all distinct tags and then taking the top 100. In a real production environment, you wouldn't do things this way; you'd maintain counts by trigger, or use HyperLogLog, or something similar. But it makes a good test of mass index access and/or table scans for the various approaches. So, here you can see that the array and JSONB approaches lose; they simply can't be as fast as a plain text column for building a count. 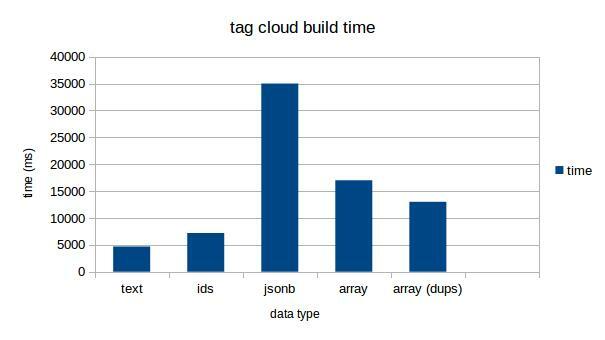 This does mean that if your application spends a lot of its time dynamically building tag clouds, arrays might not be the way to go and JSONB certainly isn't. Conclusion: the overall winner is an array of text, with a GIN index. This is better for one-tag searches, worlds faster for two-tag searches, and competitive at other tasks. It's also the smallest representation, and becomes smaller and faster still if you actually put the array of tags in the documents table. Still, there are times that you would want to use the traditional child table with plain text tags: if you build tag clouds a lot or if you never search for two tags and your ORM can't deal with Postgres arrays. Sadly, I have to conclude that my personal favorite, JSONB, isn't quite ready for this use. See discussions on the pgsql-performance list regarding how to estimate selectivity for JSONB contains. I realize that I did not test comparative write speeds. Maybe next time; I've already torn down the AWS instance. Josh, we'll work on jsonb stats for 9.6. Today we discusses this with Alexander and decided to experiment with several approaches. Great! See also the discussion on -performance about this. first of all, thanks a lot for this informative article series! As chance would have it, we've recently implemented tags in our document management system Pepa using the traditional approach with a tags relation and a join table as we are not yet at the point of optimizing performance and this is the most flexible approach. However, we've come up with a different solution for querying for multiple tags using something like GROUP BY doc_id HAVING array_agg(tag) @> array['thrift shop', 'blogging']. My guess is that it doesn't perform terribly well either but at least it makes the query much more pleasant to write (or generate) than having to join with the tags table again for every queried tag. Should you continue with your benchmarks I'd be curious how it compares, though! Thanks Moritz. We'll see if I get back to doing benchmarks again. This series is great. Thanks for taking the time. I'm implementing tags for a high-traffic production API built on Postgres 9.4, and you've convinced me to store tags in an array in the document table, together with triggers to update tag counts in a separate table (along with other info about each tag). I had previously been planning to use the standard junction table method since I have other data associated with each tag. One question: You mention repeatedly that JSON arrays stored in JSONB are order-agnostic and automatically de-duplicate. But isn't that only true of JSON objects/hashes, not arrays? Yes, I confused things between keys and array elements; see previous post. Keys are deduplicated, array elements aren't. So questions: Why are you introducing the same table multiple times in your tag-id query? Accomplish over this new query that I would propose, which only introduces each table once? Your query asks "give me all the documents with EITHER the tags 'blogging' or 'thrift shop'" What I want is "give me all the documents with BOTH the tags 'blogging' and 'thrift shop'". You could do this with a group by and an COUNT(), but in my testing that wasn't any faster. The standard join table might fare a lot better if the lookup-by-tag index had included the doc_id. Eamon: you're claiming that having an index on (tag_id, doc_id) would make a significant difference, even though we already have an index on (doc_id, tag_id)? Can you run some tests? Did you do any testing when using the tag itself as the primary key in your tags table? Using a natural pkey would probably speed things up as you can avoid a join when querying the tags no? In Postgres, there's no difference between a PK and any other unique index, in terms of performance. Also, the "text tags" setup *is* the one using natural keys for tags -- see Part I.
Josh, thank you for this article! I've been experimenting with json and text array columns like you are showing here in Postgres 9.3. I’m loving it. I look forward to your findings on jsonb in the future. I really hope Postgres continues to create these new column types. I assume that a known limitation of not doing the join is that you cannot rename a tag? Or at least to rename it you would have to update all the rows that use it. I have that requirement so I am thinking of using the array approach, but still have a separate tag_lookup table that I would never join against, but rather query that table first to get the tag IDs from the tag names. Then query against the tags column using the tag IDs. Do you see any issues with this approach? Correct. So if renaming tags is a major part of your application, then the array approach is probably not for you. I did obtain the same results when benchmarking some time ago (postgreSQL 9.2, so only "normalized" versus arrays). But I obtained better performances yet (IIRC) with the intarray extension. to search for tags 1 and (2 or 3). And it's really small in the DB ! I would love to see it added in your benchmark. For what it's worth, I just did basic performance testing using intarray extension vs text. I didn't see any substantive difference and when I add in the overhead of having to dereference the ids to tags, using text seems a better choice. I think your benchmark doesn't cover one quite common case that if usually very heavy on SQL. Get all documents tagged by X or Y or Z.
I'll give real life example: you build portfolio of 10 stocks and you want to see feed of all content related to your stocks. We're currently using Sphinx (full text search engine) for this purpose and it works surprisingly fast when searching by less than 30 tags. I've done a bit of benchmark vs GIN index on int array with intersection operator and it also works fast, but slower than sphinx. Do you maybe know a better solution in this case, or ways to tweak GIN index to optimize it for intersection operations? Can you post your actual setup and numbers? And frankly, I'd expect sphinx to be faster. It's a dedicated tool which only does one thing. If it couldn't do a tag search faster than Postgres, it would be pretty sucky.